Billy McKay's late strike earned back-to-back victories for Inverness Caley Thistle despite struggling for top form against a spirited St Mirren. David Raven did superbly to beat his man and found McKay. The striker had his back to goal but coolly flicked the ball towards the far post, where it found the target. Kenny McLean came closest for the visitors with a superb 30-yard drive that crashed off the bar, but the Paisley side's woes continue. Ross County's draw at Dundee means the Buddies are only above bottom spot on goal difference, while Inverness remain five points behind Scottish Premiership leaders Aberdeen in fifth spot. McKay should have netted in Caley Thistle's only real chance of the first half when Jeroen Tesselaar's horror pass-back put the striker clean through. He seemed short of confidence and that hesitation proved costly as goalkeeper Mark Ridgers advanced to block with his feet and the chance was gone. It was an unusually quiet performance from John Hughes' side for long periods, partly the result of some organised defending from St Mirren. McLean, the subject of £150,000 bid from Fleetwood Town, showed just why he is attracting interest. The midfielder gathered a Stevie Mallan square ball and, without hesitation, struck a fierce left-foot drive that beat goalkeeper Dean Brill but not the bar as it rebounded to safety. Caretaker-manager Gary Teale does not want to lose McLean and the midfielder further demonstrated why with a curling effort that Brill did well to tip over. McLean went close for a third time with another confident effort from distance that curled agonisingly wide. Chances were few and far between as the second half wore on, but the breakthrough came from a great piece of skill from McKay. The Northern Irishman proved his worth with a second goal in two games with a lovely flick with his back to goal. The spadework was carried out superbly by Raven, who beat his man to reach the bye-line and drilled the ball across for McKay to net superbly. McKay could have played in James Vincent, who was free in the middle, then almost netted from the bye-line as Ridgers flapped. You can see a clear improvement in St Mirren's overall play, but they go back level on points with County. Inverness will reflect on a hard-fought victory that may go a long way to achieving their aims this season. Match ends, Inverness CT 1, St. Mirren 0. 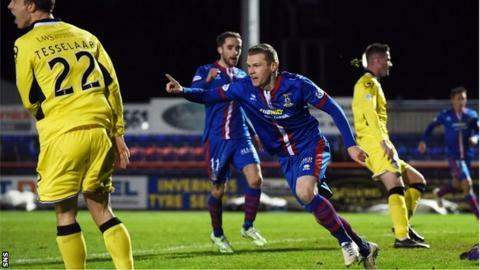 Second Half ends, Inverness CT 1, St. Mirren 0. Corner, Inverness CT. Conceded by Mark Ridgers. Attempt blocked. Danny Williams (Inverness CT) left footed shot from the centre of the box is blocked. Corner, Inverness CT. Conceded by Thomas Reilly. Attempt blocked. Danny Williams (Inverness CT) right footed shot from outside the box is blocked. Attempt saved. Billy McKay (Inverness CT) right footed shot from the right side of the box is saved in the bottom right corner. Substitution, St. Mirren. Thomas Reilly replaces Stephen Mallan. Substitution, Inverness CT. James Vincent replaces Nick Ross. Substitution, Inverness CT. Ross Draper replaces Aaron Doran. Substitution, St. Mirren. Gregg Wylde replaces Sean Kelly. Substitution, St. Mirren. Lewis Mclear replaces Adam Drury. Attempt missed. Sean Kelly (St. Mirren) header from the centre of the box is close, but misses to the left. Goal! Inverness CT 1, St. Mirren 0. Billy McKay (Inverness CT) right footed shot from the right side of the six yard box to the centre of the goal. Corner, St. Mirren. Conceded by Carl Tremarco. Attempt blocked. Carl Tremarco (Inverness CT) left footed shot from outside the box is blocked. Adam Drury (St. Mirren) wins a free kick on the left wing. Attempt blocked. Aaron Doran (Inverness CT) right footed shot from the centre of the box is blocked. John McGinn (St. Mirren) is shown the yellow card for a bad foul. Substitution, Inverness CT. Danny Williams replaces Ryan Christie. Adam Drury (St. Mirren) wins a free kick in the defensive half. Corner, St. Mirren. Conceded by Gary Warren. Jim Goodwin (St. Mirren) wins a free kick in the defensive half. Kenny McLean (St. Mirren) wins a free kick on the right wing.